score | Apple pie, anyone? Now, I personally am of the opinion that breakfast is a waste of Sleeping-In Time. The rest of my family heartily disagrees. Rylie, on the other hand, will eat shredded wheat until the day she dies. Lay money on it. Curt and Gideon: cereal fanatics as well. Curt’s a Special K boy. Don’t tell him I told you. When I found this sign in my favorite antique shop Wednesday, I had to bring it home. 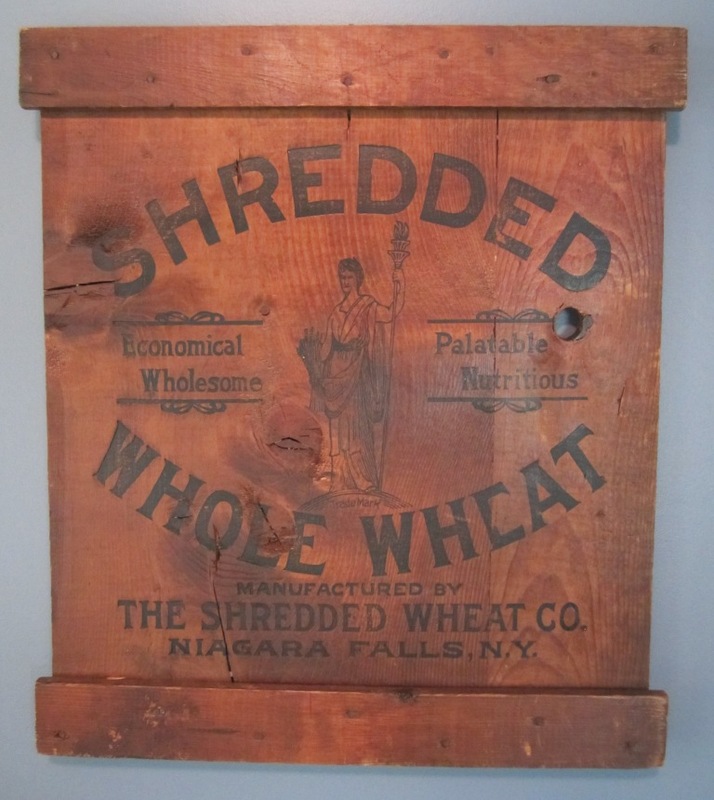 She had found it in a Heritage Hill attic on an old shipping crate from the 1890s. Obviously, it was hiding up there all this time for me. Can you believe it? Is she not just the most beautiful thing you’ve ever seen? I mean, seriously. Seriously, People. Who knew miracles like her were possible? 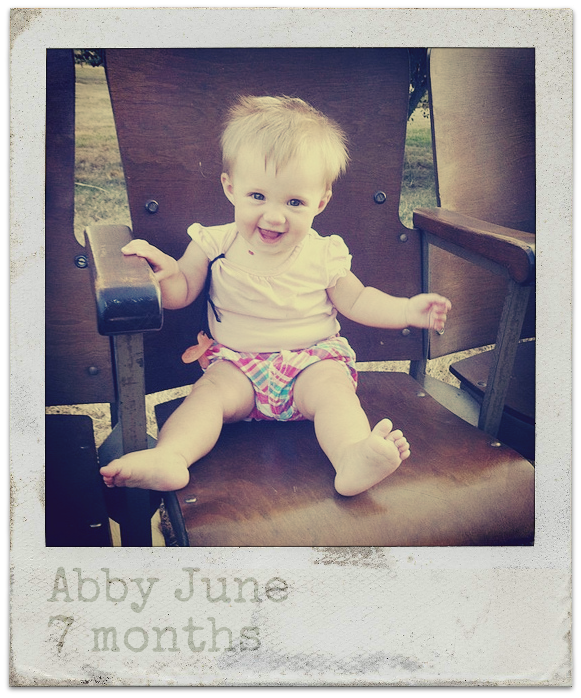 She’s sitting on a trio of folding wooden theater seats I scored on Craig’s List last week. They’ll live in the mudroom… when we have a mudroom. For now, they live in the hallway downstairs. It seemed like Fate had found me: 3 wooden chairs, 3 lockers, 3 children. Perhaps we are stopping at 3 kids? Can you know for sure? Is it appropriate to decide based on vintage furniture finds? We’re struggling. Not that a decision has to be made… but, yeah. Kinda. My brain needs a decision so I can process life a little better. I’ve heard a mother never stops thinking “maybe one more” or “what if?” No getting away from that… it’s just IN you. I’ll certainly always have that. Is it possible to know- really know– when you’re at your limit? I say NO MORE because parenting is hard. And, I’m tired. How can it be the same reason for both? We’re at high-maintenance ages with some special needs thrown in there for good measure. This complicates life in general, especially What’s the Plan? conversations. My brain (and our family) needs a little closure… or, at least sound and loving advice… one way or the other. So, if you knew, how did you know? I learned about napping from my college roommate, who would turn on Sarah low and crawl under her covers after an 8am class. When I got married and moved in with The Boy, Sunday naps became a regular thing. In fact, I think most of West Michigan shuts down after Sunday family dinners as people claim couches and cribs for a little respite. When I was pregnant with Rylie, I slept more than I was awake. I love to nap. I love to steal just a little bit of time… maybe when both kids are sleeping (what?) or occupied with Dad… and simply rest. I am a nicer person for it. Or, at least quieter. 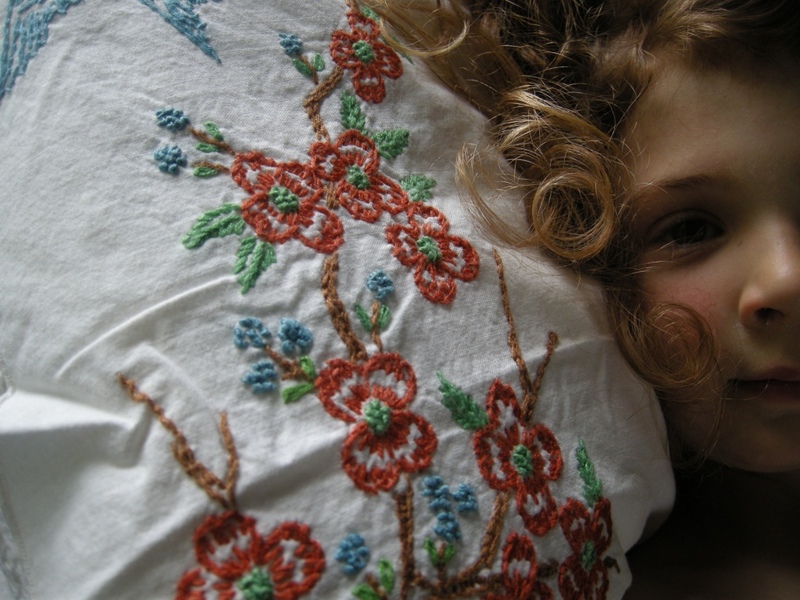 The pretty, hand-embroidered pillows make the dreams a little sweeter. Matthew chapter 11, verse 28 • Come to me, all you who are weary and burdened, and I will give you rest. Take some time… to breathe, to be quiet, to sit back, to rest. This world is heavy and often unkind. Even the strongest grow weak under the weight of their work. My home country, Tejas, is known to throw a tornado or two in the April mix of things. Michigan, on the other hand… who knew?! Way to be crazy last night (Tuesday)! Thank you to the sirens that sounded in town AFTER the hail and storm had passed. My tax dollars at work. Amen. And to our friends down south in AL, MS, GA and further… our prayers are with you as you restore. Two years ago, The Boy came home with 6 very sad screens from our very sad rental house. 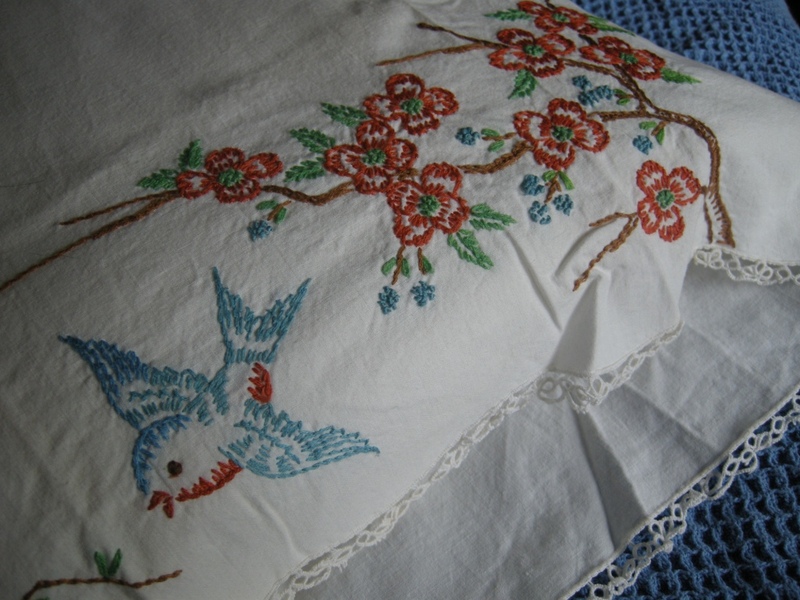 I, being the ambassador for loving the un-lovable of old furnishings, was smitten immediately. They were gorgeous. Before he had even stepped out of the truck I yelled, “CAN I HAVE THOSE? !” He said, “No. No you may not. I have to fix them and take them back. THEY ARE NOT FOR YOU.” But this weekend, they were still sitting in the back of the pole barn, still gorgeous blue, still un-mended. I gently washed and starched the towel. 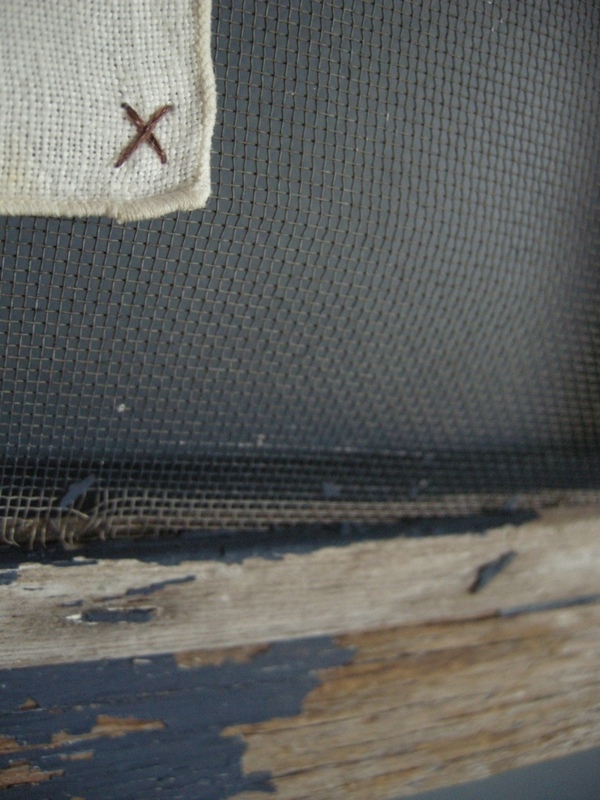 Then, taking some brown embroidery thread, I attached it to the framed-screen using 7 simple x’s. Easily undone should another option come available, simple and rustic for the time-being. I hung it, without permission, above the bed his father made for us. I think it’s just absolutely perfect. If I told you summer through a metal screen is my favorite smell, would you understand? Or would you shake your head in wonder? DOUBLE high-five if we’re speaking the same language. 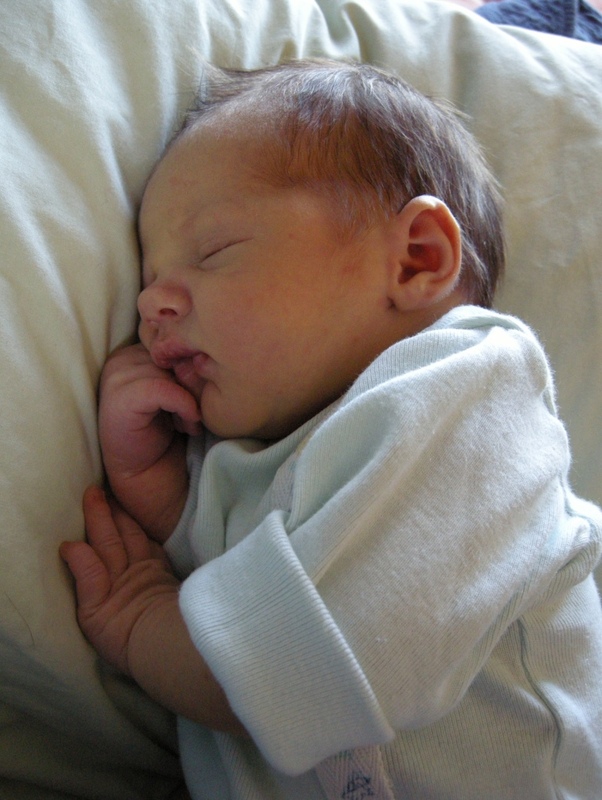 My son (That is soooo weird to say. Wow.) has incredible abs. I’m sure all babies do, but remember that our first child was/is a little bird of a thing and this second kid is a hulk. It’s a whole new world for us. As requested, here is my daughter (Also weird to say, but not nearly as much since I’ve had almost 4 years of practice.) telling you ever-so-briefly about the horse incident. You will notice that her sentiment has changed a bit from empathy and agony to indifference. *sigh* I’m still typing with 9 fingers but whatever. After reading Lauren’s (LoLo) garage door tale, I am considering my injury a mere step above a paper cut. A large wild stallion paper cut, but a paper cut. These chairs are on their way to the Shoebox. After 5 years of no bar stools, 5 years of searching every online and brick&mortar barstool store, 5 years of having mismatched and slightly broken chairs at the island… these chairs are coming. In Wedgwood blue. There’s one for you. Come on over. 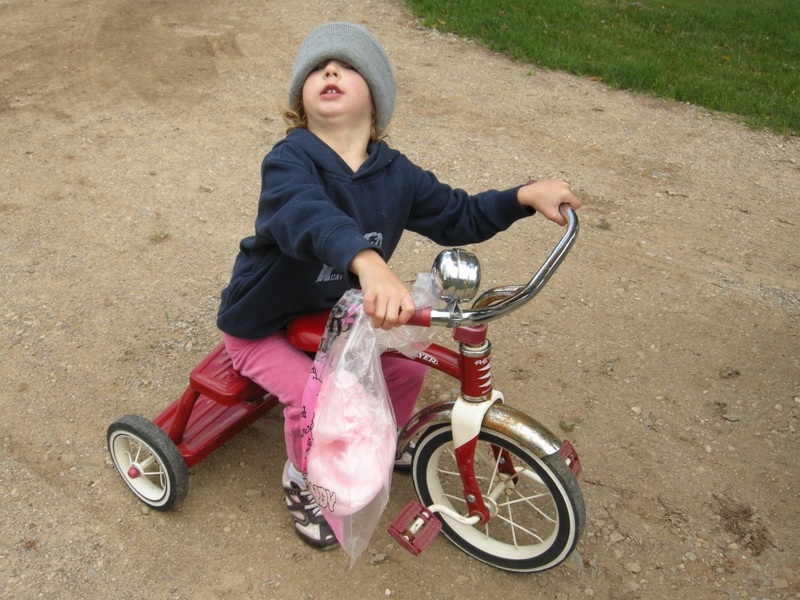 I found Ry a red rider tricycle for $5 at a garage sale this weekend. She’s still working on the pedaling part. This photo was taken at 10am. Yes, that is a half-eaten bag of pink cotton candy. I’m the world’s coolest mom. When is it ok to buy new dishes? I’m guessing 6 years is not enough time since my parents only JUST bought new dishes after 25 years. But I heart these. so. much. Hey, thanks for all your notes about our vacation! That was very sweet. You are all welcome to join us anytime. Or, if you can wait, come to the barn re-raising in a couple of years and camp out on our property 🙂 I’ll make you some pie and lemonade. Oooo! Ooooo! And, we can have a hayride! And a square dance! IN THE BARN! Monday, y’all, we’re gonna have a discussion. A discussion about all the things they don’t tell you about havin’ a baby. Man. This is #2 for me and I’m STILL in the dark about half of it. The past week has been extremely educational for me. Today, simplicity. Things that make your life better. • the white buffet thing I couldn’t get out of my head after shopping for a dresser… I had to return 2 days later to buy it. It doesn’t do anything special. It’s made with old, uneven wood and isn’t perfectly level. 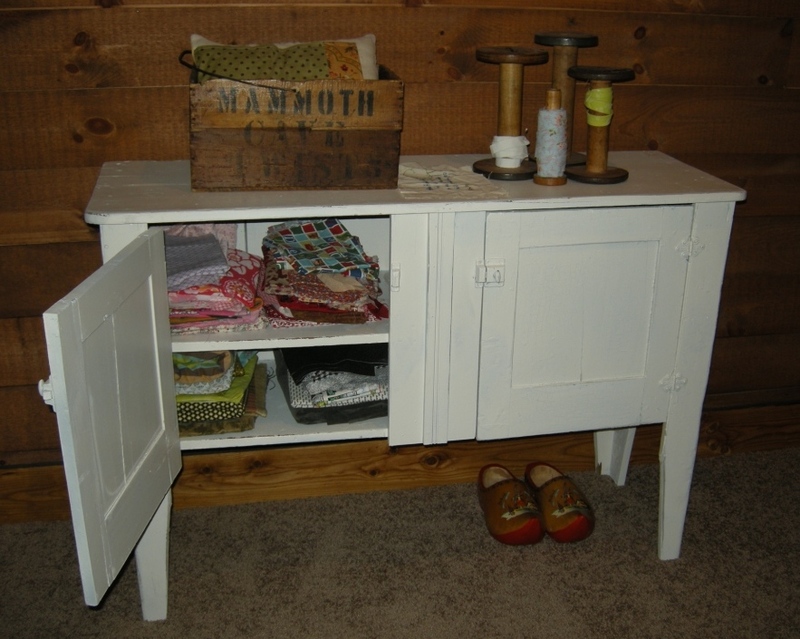 But, it holds all my fabric beautifully and looks great against the wood wall in the basement. • the 3 full-size lockers I found more than a year ago… they’re on the wrong wall and are extremely dusty right now. But, they’ll hold coats and a vacuum and anything else we want to hide next to the basement door. 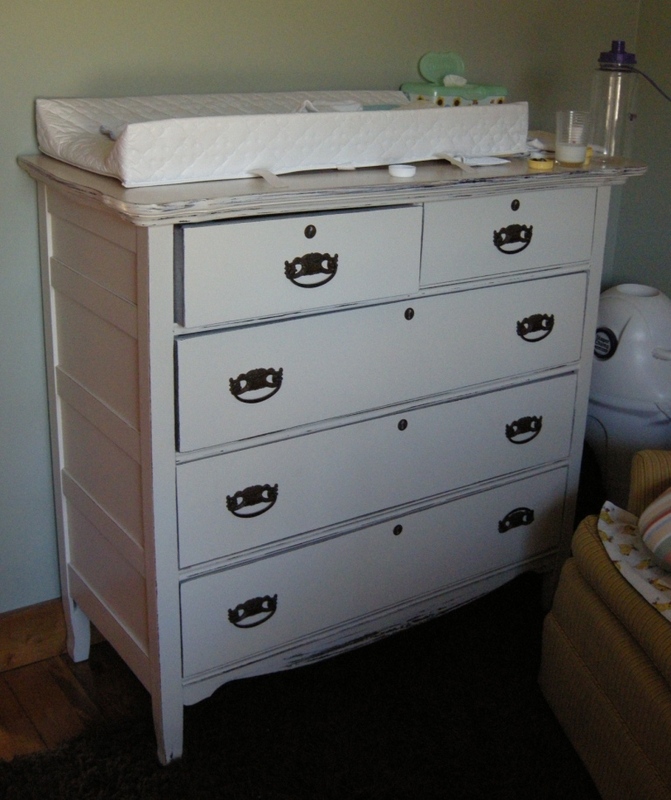 • the dresser we eventually found in a different shop… it serves double duty as a changing table. There’s also an old glass of milk, 2 dirty diapers, and a permission slip for Rylie on there. Whatever. Obviously, I like re-using things. Furniture is expensive. I figure, why not find a piece that’s already got a story and add another chapter? Whew! All your baby names are freakin’ AWESOME. It makes me wanna have about 70 more kids so I can use them all. Kinda. Today we’re talkin’ about basements. Do you have a basement? Texans don’t have basements because the ground is too rocky. My knowledge of basements before moving to Michigan was limited to my Grandfather’s cellar. Scary. Dark. A bit damp. Creaky stairs. Questionable contents in far away corners covered in ginormous cobwebs. Imagine my hesitation when I moved to Michigan and went a Bible Study and saw “Come on down to the basement!” Awesome, I thought. These people are going to tie me up and kill me. (overactive imagination, sorry) What I found was an oasis of white (white!) carpet. Light. Large sectional couch. Artwork. Master bedroom. IN THE BASEMENT. I’ve since learned this was a ‘finished‘ basement. 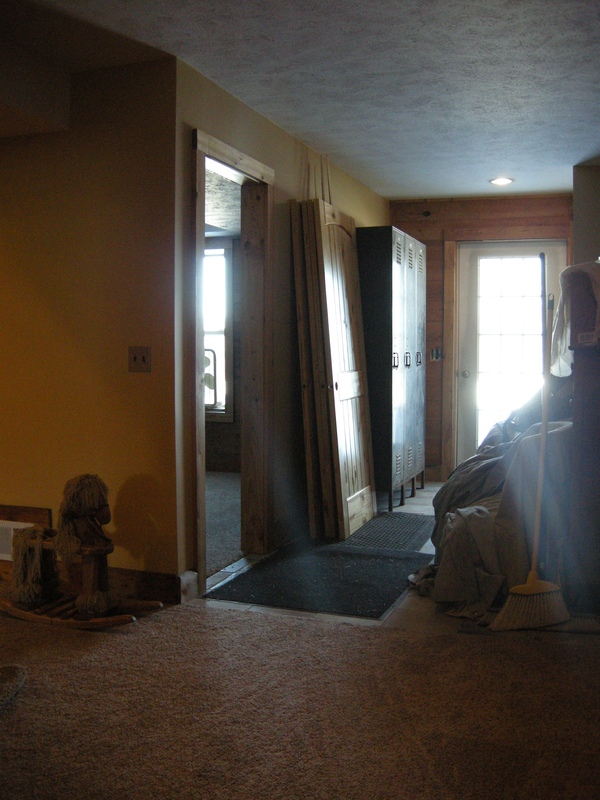 Our/Curt’s first home had a ‘Michigan‘ basement, which is closer to a cellar but way less creepy. Still with the bare concrete walls, still a little dark- but it’s where you do your laundry and woodworking and hide all your canned goods. It’s also where you wash the dog. (still with me?) The Shoebox at TexasNorth is an old migrant house- a rectangle that someone added a cement basement to about 20 years ago. You can exit down there (term: walkout) There’s a door at one end with a nice big window. I always liked that because I feel less likely to be held for ransom in a basement that has an exit. So, for the past 3 years that’s where our camping gear has lived and the washer/dryer and various electric tools. Upstairs has 2 bedrooms, 1 bath, and a kitchen/living/dining common room. It’s little. Maybe 900 sq. feet? The basement is equal to that, but not- how you say- finished. You don’t hang out down there. We have all longed for another place to escape to in this house, especially during the 14th month of Winter. As of Wednesday, half of the basement is a living room, a bedroom, a tiled foyer, and a sewing wall. We added half a house. I say we, and I mean Curt… but you know that. I picked out the paint, though. It echos the upstairs paint, as does the tile. The Shoebox is small and craves continuity. Ry now has a serious big girl room that easily transitions into a guest room. The laundry is closer to my movies- motivation, perhaps? The tv has been relocated and no longer faces the large upstairs window, making us look like the Griswalds after 6pm glowing blue for all the world to see. 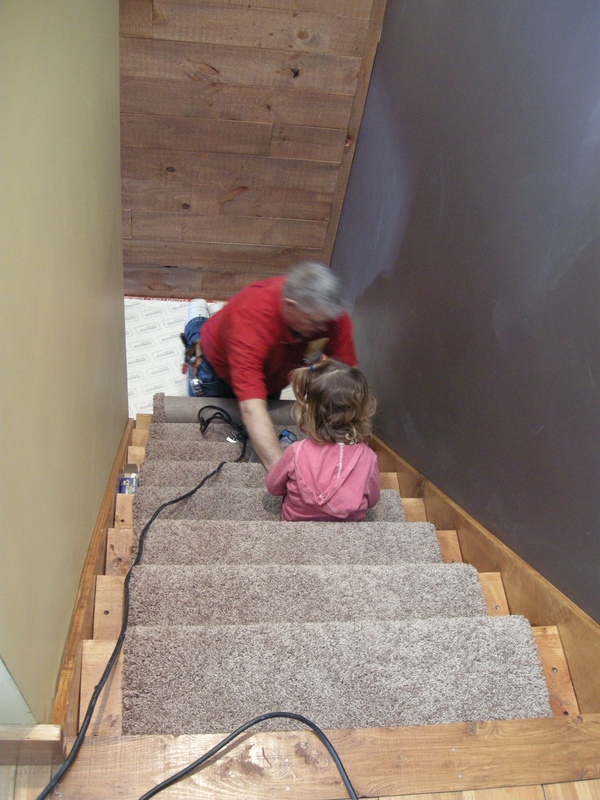 There is carpet and a fabric couch… meaning everything is soooooft compared to the wood floors and leather furniture upstairs. 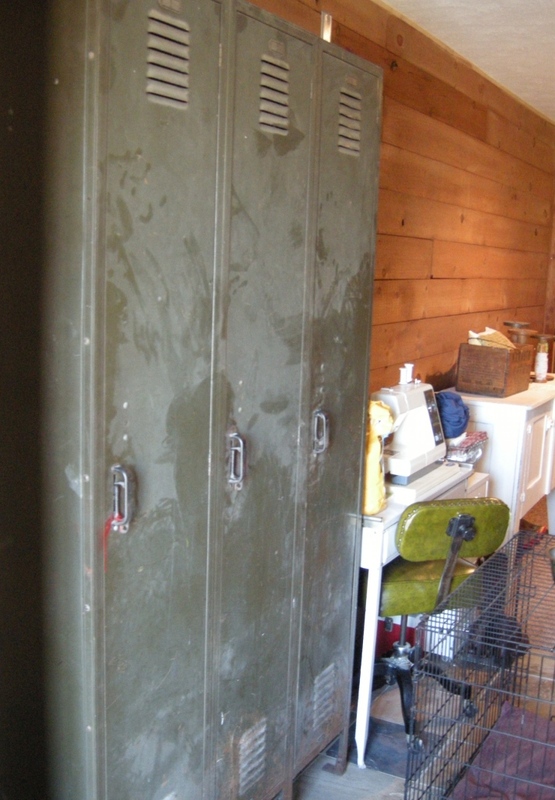 There are vintage lockers I scored 2 years ago to hold boots and barn coats and marshmallow sticks. There are yellow walls, blue walls, and wood walls. This was completely Curt’s idea. I heard wood panelling and envisioned shiny fake wood of the 70s era. Erm… boooo. Now, I absolutely love it. It’s incredible. 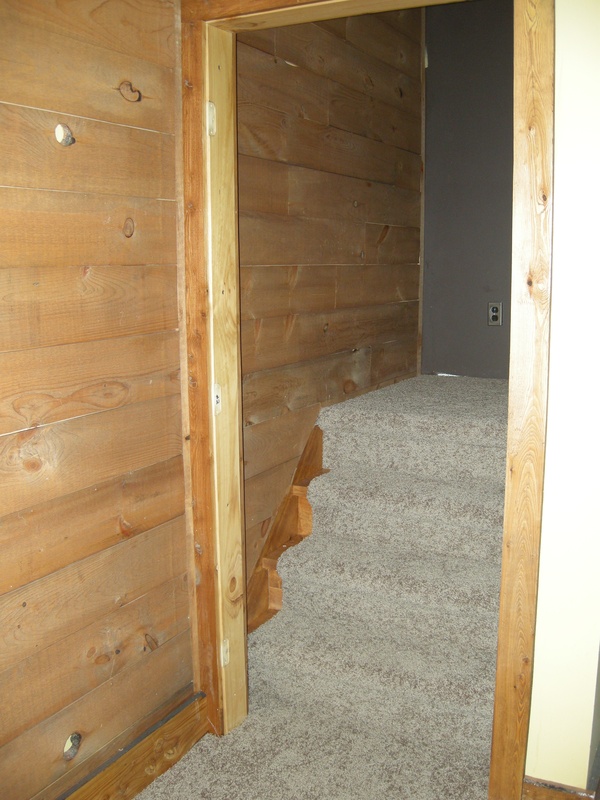 Rough, knotty pine along one wall of Ry’s room and the entire length of the hallway. You feel like you’re in a cabin. It’s very warm. Very rustic. Very un-70s. Go Curt. Gold medal for you. I got a basement. And carpet. And a non-random-corner to sew in. I don’t even know what to do with myself. Bring on the company and the newest addition to our family. We have room for you now! Come on over! 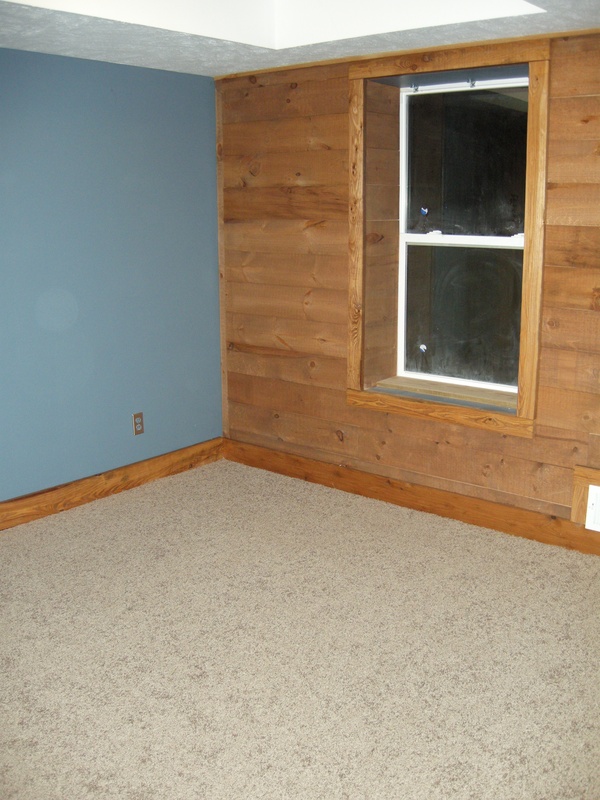 I’ve got a finished basement!